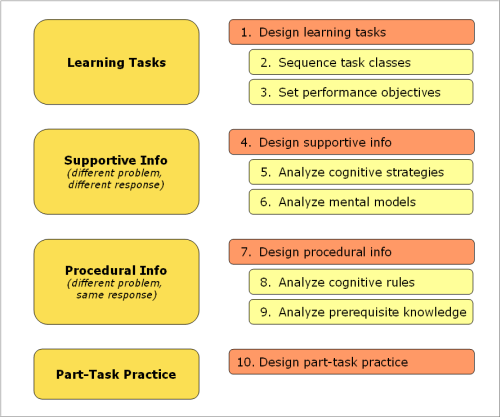 In Ten Steps to Complex Learning, van Merriënboer and Kirschner say that “part-task practice is often pointless.” That’s because Ten Steps emphasizes whole-task learning, both for the recurrent and non-recurrent aspects of complex skills. Part-task practice, though, is one of the four main components. So, why this Step 10? Because some of the time, it makes sense to practice part of the complex skills–specifically, certain recurrent aspects that demand a high level of automaticity. You can think of this as an exception to the whole-task approach. The main idea is to make the application of those skills instinctive. In my own case, I learned to type when I was 11; the recurrent aspects are now so automatic that looking at a keyboard slows me down. I also can’t tell you which fingers I’d use for a given word unless I type it on an imaginary keyboard. Notice: typing is the recurrent skill; writing is non-recurrent. What that means is that as I compose this post, I’m doing some things I’ve never done before. I’m conceiving ideas and putting them into these particular words for the first time (hence, non-recurrent). But the mechanics of typing are always the same (hence, recurrent). Recurrent skills are ones that you apply the same way to each task that calls for them. You can see the benefit of automaticity that comes from practicing musical scales, doing math problems, or completing drills for touch typing. Make it easier to perform other skills. vM&K give the example of learning the order of the alphabet so as to enable the use of dictionaries and other alphabetical tools. Enable simultaneous performance with other skills. Air-traffic controllers need to recognize dangerous situations while tracking new aircraft and communicating with pilots. Build mastery for critical skills. Some tasks demand automaticity but can’t reasonably be practiced in whole-task settings: emergency shut-down of a reactor, responding to cardiac arrest, controlling a fire at sea. I once hear Jim Fuller say that practice doesn’t make perfect; it just makes permanent. He was talking about practice without guidance or feedback. vM&K would agree. Corrective feedback is an essential part of learning procedural tasks. Part-task practice is straightforward, since by definition you’re practicing a procedural skill or applying if-then rules. You’re not performing that practice in a high-fidelity environment, though. You (usually) don’t practice your piano scales in a concert hall with an audience; you don’t do batting practice in the middle of a game. This chapter talks about “produce items,” as in “produce the answer to this problem.” That’s the default form of practice, though vM&K mention some others to use in certain situations, such as when the task is long, complex, or prone to errors. Edit items ask the learner to correct a solution by identifying incorrect steps or solutions and supplying the correct ones. This is a good method for dealing with typical errors. The three approaches can appear in a fading strategy: begin with recognize items, move to edit items, and end with produce items. Because practice involves procedures that always yield the right solution–there’s not a lot of discussion regarding long division–there’s no need for problem-solving guidance. At times, however, it’s helpful to constrain the performance situation to help prevent ineffective behavior. This is the training-wheels approach. You can see examples like hiding multiple toolbars as someone learns the basics of a word processor, or starting sky-diving practice by jumping while attached to an instructor. Divergence of practice items means that you’re covering all situations to which the procedure or if-then rules apply. For typing, that might mean drills that include upper-case letters, numbers, and punctuation marks. Back in the discussion of Step 2 (sequencing learning tasks), I tried to figure out what vM&K meant by “part-task sequencing.” When the whole task is too complex for a learner to practice, you design learning around logical parts of the whole task (e.g., you work on documenting on-the-job performance, then on coaching an employee to improve performance). One technique is segmentation: you break a procedure into distinct parts. If the whole task is repairing a flat tire, you might practice removing the tire, then repairing it, then remounting the tire. A good technique when the performance steps are essentially linear. Simplification makes sense for tasks with steps and decisions. To learn subtraction, for example, you first practice problems that don’t require borrowing. When that’s mastered, you work on simple borrowing–say, only one case of borrowing per problem–and finally on problems requiring multiple borrowing. With fractionation, you break a procedure down into functional parts. In typing, for example, practice problems involve only the index fingers, then the middle fingers, and so on. This is another long chapter, so I’ll stop the post here. Next time: part-task practice and procedural information; overlearning. By the way, although this is the tenth step, it’s not the last chapter of the book. Chapter 14 covers use of media, while 15 deals with self-directed learning. There’s a short “closing remarks” chapter as well. I’ve only skimmed these, so can’t say yet whether I’ll make a separate post for each one. Keyboard image from Microsoft’s clip art. CC-licensed skydiving photo by Dawvon. Next > You? Auto? Practice.